of must-have applications empowering the Cisco Unified Communications & Collaboration for enterprises and small-medium businesses. 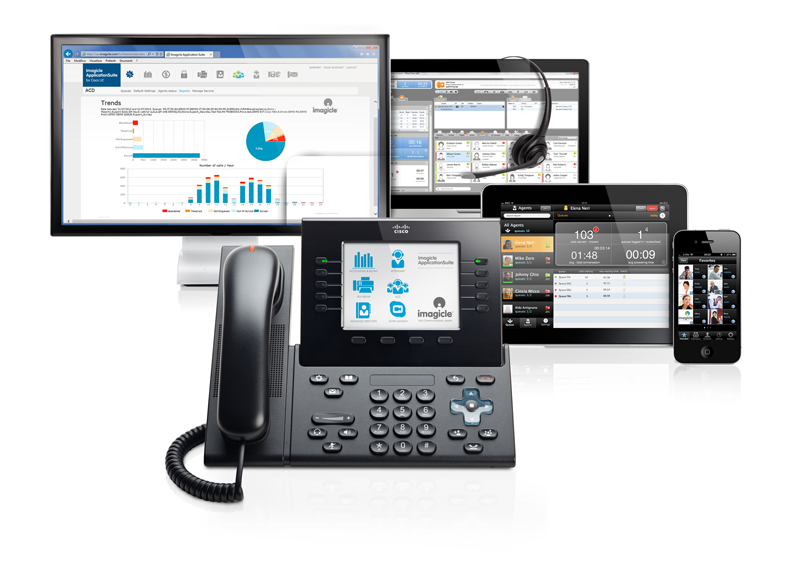 It addresses the needs of organizations from any viewpoint, providing the most complete set of UC applications, thus granting an exceptional, easy experience to all users, from their IP phones, from their Jabber desktop-mobile clients, browsers, and mobile devices. One Suite, One Virtual Machine, One Deployment, One Support. PICK UP WHAT YOU NEED. Choose a bundle or a single app and try all the other ones for free. Going live, as easy as activating a license. OneSuite grants great savings with one deployment, but you'll love also how affordable it is for 50 or 25,000 users. You can always count on our support program, ImagicleCare. It's included in every app and you'll love it. On-prem, hosted or in the cloud. With the Imagicle Virtual Appliance, it's ready for any virtualization enviroment. Each user can choose from among six languages, while operators and agents can use their apps in eight languages. services over WAN for Disaster Recovery. Clear value for all customers. 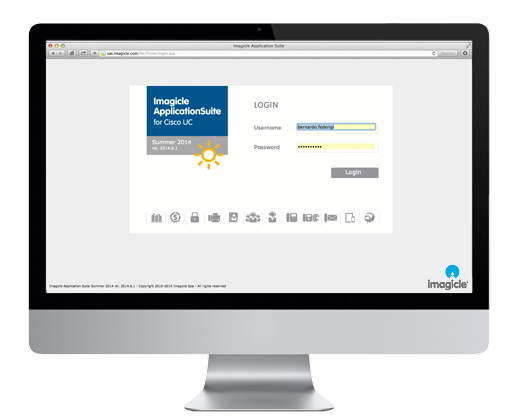 That’s why you should choose the Imagicle AppSuite for your Company. Best in class, attractive and easy apps. The perfect fit for any workspace. For standard users with any IP Phone and PC. A powerful and easy solution for your customer service. Any desktop users with Cisco Jabber for everyone or full edition. Needing to access UC&C services anywhere on their smartphones and tablets. Peace of mind for administrators. One Suite means saving time and hard dollars, as operations can be reduced to a minimum: i.e. users can automatically synchronize with CUCM or Microsoft Active Directory and are shared among all the apps. Administrators can simply manage all the applications from an easy-to-use web interface, coherent for all the services and with advanced email alarms and SNMP traps, they can integrate their network monitoring solutions for their peace of mind. See complete compatibility details on each application page. Manual or automatic from multiple CuCM cluster via AXL or Microsoft AD, LDAP/OpenLDAP systems and CSV files. Yes, based on proprietary DB replica. Support of either internal and external DB. Imagicle AppSuite for Cisco UC is officially certified against the latest releases available for Cisco UCM, BE6K/7K and HCS. Cisco has chosen 5 Imagicle apps (Attendant Console with Advanced Queueing - Auto Attendant, Hospitality Services, Billing, Fax and Directory) as official solutions and added them to the Cisco GPL-SolutionPlus. If you have selected applications from different groups (e.g. 2 Small and 1 Medium), you should consider all of them in the highest group of the server requirements with a weight of 0,5 per each Small App and of 0,75 per each Medium App (in the example you should consider them as 2 Medium apps). *CTI applications for Attendant Console and Desktop users should be considered as a single app for the server requirements. ** Hotel Pack for Cisco UC should be considered as 4 apps for the server requirements. It is possible to run the Imagicle AppSuite on the same Cisco UC on UCS server. Your preferred Imagicle solutions, can be co-resident with the Cisco Unified Communications virtual machines on the Cisco Unified Computing Systems (UCS), providing cost saving and even more integration with Cisco. Identify the server required on the basis of the number of applications to run on the same server and on the size of your apps. Apps are classified for that scope on the basis as the size they're usually proposed to different type of Customers: Small businesses, Medium businesses and Large Enterprises. You can find out more regarding the Cisco Virtualization software requirements here. Refer to this document to identify if the specific Cisco UC app that you are planning to run on the UCS server does support FULL coresidency. Example: As of June 2012, Cisco Emergency Responder and Cisco Unified Attendant Console (Business, Department or Enterprise) can't be co-resident with any third party virtual machine, so they limit the UCS server to only be used for Cisco UC apps. Consider using Blue's Attendant Console Enterprise or Professional in your projects, for reaching extra savings optimizing UCS investments and offering a better service to your customers. * Hard Disk requirements are specific for applications deployment plus the included Microsoft SLQ Server 2008 Express database only. Should you require a larger database for CDR analysis, faxes or directories, you have to consider additional storage resources. The Cisco UC Virtualization Foundation OEM option is only sold and supported as an add-on SKU for use with Business Edition 6000 and 7000, Packaged Collaboration Solution and UC on UCS. It is not available or transferable for use with non-UCS hardware or non-UC software. Physical server Hardware restricted to 2-socket Cisco UCS models. Licenses cannot be split for 1-socket servers or combined for 4-socket servers. Max vCPU per VM is 8. Supports connection to VMware vCenter management (vCenter software must be purchased separately). Does not enable any other advanced features (such as VMware High Availability, Data Recovery, vMotion, Distributed Switch, etc.). i.e. Cisco Collaboration apps and 3rd-party apps in Collaboration category of Solutions Plus or Cisco Developer Network, with a maximum count of 3rd-party VMs. . Some of the best support I've ever experienced!